3rd day in paradise. We decide to take a hike along the coast. My NZ guidebook says “One of the island’s finest walks (2-3 hrs) which visits secluded beaches and windswept headlands ….” Sounds good to me! 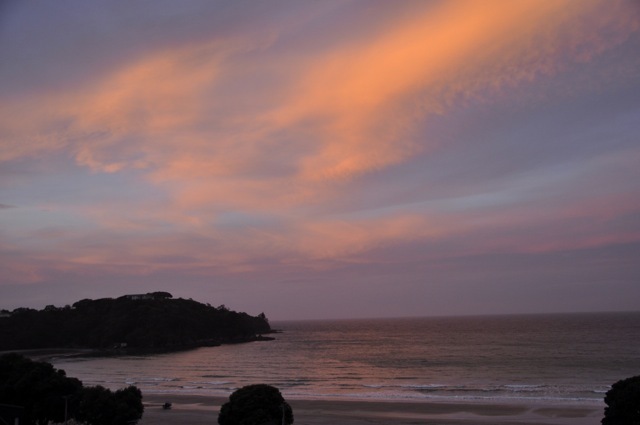 It visits 4 bays – Fossil Bay, Island Bay, Owhanake Bay and Matiatia Bay. And pretty it is! Now, pretty as those pictures are, we’re now heading toward 3 hours of up and down, we’re in the middle of nowhere, and Ginger is getting tired. We have light, but like an hour or two. There are two “bails” shown on our map that go up to a ridge road, but we’ve seen other trail offshoots that look like bails, we’re not quite sure where we are on the map, and that ridge road itself winds around quite a good distance before it gets us back to somewhere we can bus or taxi home. It’s shorter, but it’s not short. I convince Ginger she can do it, and to press on. She agrees, but is not happy. I would say grim. The next section going down is really really steep, mud slippery, and on an edge. It’s not too bad, really, but Ginger is not amused. Then in looking at the map, she notices what it says about our trail (the map describes 10 separate trails on the island): “3 hours: access from wharf at low tide only. A challenging route, with some steep, exposed and slippery sections ….” So now she’s gone from “not happy” to “pissed”. Somehow I’m at fault here. She occasionally expresses displeasure. Then at the base of that last picture’s headland (above) is a sign that says how far we are from the end: “3km (45 min); the last stretch impassible an hour either side of high tide. Experienced trekkers only”. Oooookay. I’m thinking we’re pretty close to the other side of high tide; but how much? But that is enough for Ginger, who looks tired, is a bit red in the face, and wants to kill me (luckily the cliffs are back a ways). So off we go, goodness knows where, up a trail that may or not be the bail on our map. It is steep. I keep out of swinging distance. Finally we get to the road. It’s desolate, with occasional driveways disappearing into the forest. We can at times see our destination on the other side of the ridge, but getting there? The road goes parallel to it. A couple cars pass, and I ask if we should flag one down. Ginger doesn’t answer, but is either thinking about it or is planning to throw me under one. Hey, why is this my fault? Luckily we pass a lady walking her dog, and she shows us a driveway we passed that says “Private; do not enter; not a path to beach” and says “That’s a path to the beach, keep right”. So off we go. It’s not short, and it takes us back to the part of the trail along the beach that is impassible at high tide, but it is passable, and we limp to the end. We just miss the bus, and it is an hour until the next one, but a local takes pity on us and drops us off in the little town near our apartment. Whew! We decide to celebrate our adventure and survival with a good meal and good wine. Picture of the view from the restaurant is below. Isn’t that nice? From the looks of things, I’m still in the dog house.